The war on coal is in full steam with the latest EPA regulations that went into effect. This Bloomberg story talks about how sneaky the Obama administration is. Here’s a little background. Because of the carbon tax levied on power plants that burn coal and the over drilling of the Marcellus Shale, natural gas became a cheaper alternative for power plants to create electricity. In February of this year natural gas prices spiked and power plants started to burn coal again because it was cheaper. The Obama administration raised the carbon tax very quietly by 60%, making natural gas with its elevated price once again the cheapest source. The Bloomberg article details how it was done by slipping it in with some new air conditioning regulations so they wouldn’t take any heat over it. I might remind you Bloomberg is a raging liberal, and even his publication is crying foul. Coal doesn’t have a chance with an administration that simply raises the fine for burning coal every time coal becomes a cheaper solution. It truly is a war on coal. The next war will be on natural gas after they destroy the coal industry. The human toll is something that’s not being reported anywhere. The average pay in the coal industry is $68,000 per employee. That’s not just miners, that’s secretaries, clerks, etc… Extremely high paying jobs that are being eliminated 300 – 500 at a time. The last mine to close in WV laid off 504 employees that averaged this pay. When you see the Obama administration tout the jobs they’re creating, those jobs have average pay around $35,000 annually. That’s one reason our economy is stuck, you need to create two jobs for every one job Obama eliminates. And that would only keep us even. For growth you need 3 jobs at the Obama pay rate to replace one good job in the coal fields. When you live in WV you can easily see the problem with Obama’s so called jobs plan. Obama claims, repeatedly, ad nauseum, he is trying to save the middle class, while his war on coal is proof, he is busy wiping out the middle class and increasing middle class dependency on big government. And by the way, most of these people who were making $68,000 a year have high school educations only. Their average age is around 45. Where will they find similar jobs? There aren’t any coal mines in cities the size of Tampa. These people live in rural areas of KY and West Virginia mostly. Why don’t they move you ask? How will they sell their homes? 500 of the richest people in a coal mining community of 5000 lose their job on the same day and put their houses on the market. With that glut of homes how could they get a fair price even if the could find a buyer? Who would hire a 50 year old with a high school education with only mining on his resume? Couldn’t they retire you ask? Many of the coal companies laid them off because they’re filing bankruptcy. Even those who were retired from a coal company had a federal judge uphold the coal company could cut their pensions by 70% and end their health care. In short, THESE PEOPLE ARE SCREWED! And finally the irony of it all. Without exception most of these miners are Democrats and supported Obama in the 2008 election. Even after he turned on them, the UMWA labor union still supported him lock, stock and barrel in the 2012 election. Romney came to WV and held a rally and told the miners, if he were elected he’d restructure the EPA and have them back to work in 100 days. They still supported Obama. There is a saying about folks like that. If God didn’t want them shorn, he wouldn’t have made them sheep. 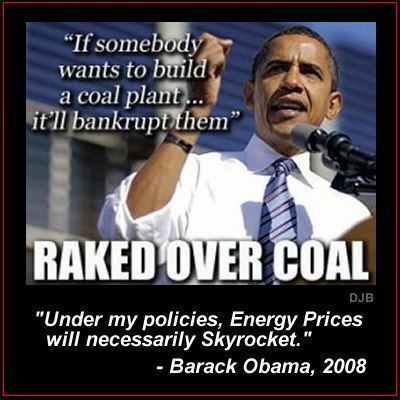 Obama was very blunt in 2007 when he said, you can build a power plant that burns coal but we’ll bankrupt you. For once, he is a man of his word. NOTE: Nearly 300 coal-fired power units nationwide have closed or will be retired this year. Other plants have switched to natural gas. A total of eighteen (18) coal-fired units in West Virginia have announced their plans to close. It is estimated that each unit accounts for approximately 100 full-time positions, thus the total number of jobs impacted in West Virginia by these closures is approximately 1,800 additional jobs. Across the Appalachian region, the damage is even worse, with approximately 10,000 direct mining jobs lost and another 40,000 indirect jobs lost. The net effect is the removal of $719 million from West Virginia’s economy and a $2.05 billion loss from the region. These are real dollars that have been lost, impacting every family and business in their area.